As of midnight on December 21, 2018, the President and Congress were unable to agree on the provisions of a Continuing Resolution (CR) to fund the federal government. As a result, a partial shutdown of some government operations has occurred. 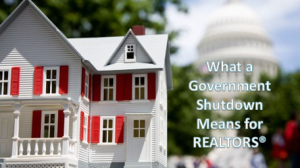 This partial shutdown includes some federal housing, mortgage and other programs of interest to the real estate industry. A summary of the impact on selected agencies is provided below. While this is a very politically dynamic event, NAR staff continue to monitor federal agencies and work with Congress, the Administration and other groups to assess ongoing impacts to NAR members and their businesses. Under EPA’s shutdown plan, most employees are now furloughed. This will affect various regulatory programs and compliance activities, such as wetlands determinations under the 404 program and enforcement of the lead-based paint disclosure and renovation, repair and painting programs. HUD’s Contingency Plan states that FHA will endorse new loans in the Single Family Mortgage Loan Program except for HECM loans. It will not make new commitments in the Multi-family Program during the shutdown. FHA will maintain operational activities including paying claims and collecting premiums. FHA Contractors managing the REO/HUD Homes portfolio can continue to operate. Some delays with FHA processing may occur due to short staffing. Read more about these delays. After NFIP operations were initially suspended over questions raised by government attorneys, NAR worked with the White House and Congress to clarify that the government shutdown does not affect the sale or renewal of flood insurance policies or the payment of claims on existing policies. Disaster relief, airport screenings and other essential homeland security functions are unaffected. View the FEMA release resuming the full and normal operations of the NFIP. NAR has asked the Trump administration to provide relief to people whose Rural Housing Loan Program mortgage applications have been held up by the partial government shutdown. In a Jan. 16 communication, the association requested that the U.S. Department of Agriculture, which runs the Rural Housing Service, assign staff to process the loan applications as part of its plan to reopen Farm Service Agency offices temporarily during the shutdown. The U.S. Department of Agriculture will not issue new rural housing Direct Loans or Guaranteed Loans. Scheduled closings of Direct Loans will not occur. Senior USDA officials advised us that the Rural Housing Service will not guarantee loans that do not have a conditional commitment issued before the loan is closed. USDA equated closing loans without a conditional commitment to the FHA Direct Endorsement program and USDA said they have issued no regulations, handbooks or audit procedures permitting that practice. While some lenders may be considering GUS approval as tantamount to a conditional commitment, USDA reminded us that there are other steps in the USDA loan approval process (e.g. funding availability). They added that there is no precedent in the USDA program for guaranteeing loans that do not have a conditional commitment issued before the loan was closed. VA has issued two new circulars concerning the shutdown. VA encourages servicers “to extend forbearance to borrowers in distress as a result of Federal Government shutdown”. VA describes measures regarding loan origination as a result of the shutdown. As long as the loan is current and you have been able to obtain all required documentation (pay-stubs, W-2s, VOEs, etc.) prior to guaranty, the loan remains eligible for guaranty. An NAR survey of 2,211 members found 75 percent had no impact to their contract signings or closings. However, 11 percent did report an impact on current clients and 11 percent on potential clients. If respondents reported an impact on current or potential clients, they were asked further details. Respondents were allowed to pick more than one response, as they may be working with more than one client. The most common impact, at 25 percent, was the buyer decided not to buy due to general economic uncertainty, though they were not a federal government employee. Among those impacted by the shutdown, 17 percent had a closing delay because of a USDA loan.